Don't Blame It On Jane! While I'm not a complete Jane Austen fanatic, I do enjoy her work and she seems to be popping up regularly in modern fiction. 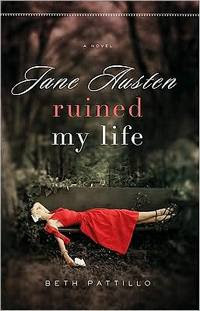 A new edition to the crowded field of Austenalia is Jane Austen Ruined My Life by Beth Pattillo. This story is set totally in London, so that is a big plus right from the start! Unfortunately, the plot is rather frustrating. Emma Douglas, the heroine of the story, is a Jane Austen scholar who has recently resigned in disgrace from her teaching position. Her cad of a husband was having an affair with Emma's teaching assistant, and together they framed Emma and accused her of plagiarism. Emma flees to England when a somewhat shadowy contact there promises to provide her with some heretofore unknown Austen letters. Once she arrives at her cousin's London flat, Emma discovers that it is already occupied by Adam, a friend from the past. Emma's Austen contact proves to be a somewhat dotty elderly lady named Mrs. Parrot who sends her on a series of Austen-related trips throughout the country. At the end of each trip, a new Austen letter is revealed. It all seems like a bit of unnecessary running around, but I suppose there wouldn't have been much of a story without it. The scenery is described very lovingly, and it was easy to tell that the author really loves England and admires Jane Austen. Sadly, this proved another one of those the-protagonist-is-extremely-self-centered-but-every-other-character-bends-over-backward-to-help-her-books. And she really doesn't seem all that worthy of all the intrigue and devotion that everyone seems to have for her (except for the horrible ex-husband, that is). The ending was a real let-down. While Emma started the story with everything against her (no husband, no job, no money, no academic reputation), at the end she is given her choice of glittering options to choose from. However, she prefers to just sort of drift around with nothing really settled. Sort of a "meh" ending . . . why read all through the book if soppy Emma was just going to throw away everything? By the way, from what I could gather (through all of Emma's woe-is-me whining) Jane Austen ruined her life by making her believe in happy endings. Maybe the author was going against that sentiment by having no ending at all? Yes, that's a much better idea. This one looks good but you say the main lady is weak. Oh I hate that. I like strong independent women characters... the wishy washy ones just drive me nuts.